A graphical representation, image or a scan of a handwritten signature. A contract relating to such transaction may not be denied legal effect, validity, or enforceability solely because an electronic signature or electronic record was used in its formation. Documents related to the transportation of hazardous materials. The laws of electronic signatures also apply to emails. Parties can create enforceable agreements through email if the email sets forth the material terms of the agreement and clearly shows that both parties intended to agree to those terms. In order to have a valid electronic signature in an email, the signature should show a manual input entered by a person who intended to agree. A graphic representation or image of the signer’s name or signature. Under the ESIGN Act, parties are not compelled to accept electronic signatures if the parties prefer traditional methods of signatures. Thus, the ESIGN Act requires that the parties consent to enter into the transaction through electronic means. The ESIGN Act requires the signer show an intent to sign the record. 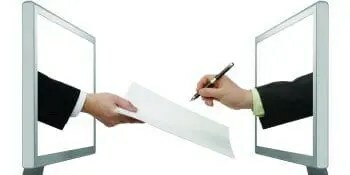 That means whoever signs electronically should be able to confirm his identity and the “intent to sign.” Since the ESIGN Act requires intent to sign the record, any evidence that shows lack of intent, helps the signer avoid liability in the event of unauthorized use of the electronic signature. New York businesses must carefully control and monitor the use of electronic signatures. They should only be available to a limited number of persons that are authorized to bind the business to an agreement. Those persons should clearly state in any electronic communication that they do indeed have such authority. There should be a business record that confirms who has such authority created so that there is no confusion down the road should there be an unauthorized use of an electronic signature. When Must Your NY Business Agreements Be In Writing? Enforcement of Liquidated Damages Clauses in NY?